Seniors Jimmy Dunagan and Ryan Vanario became the first Eagles to claim individual wrestling titles since Brandon Foster’s 2013 win, ending Boulder City High School’s state championship drought. 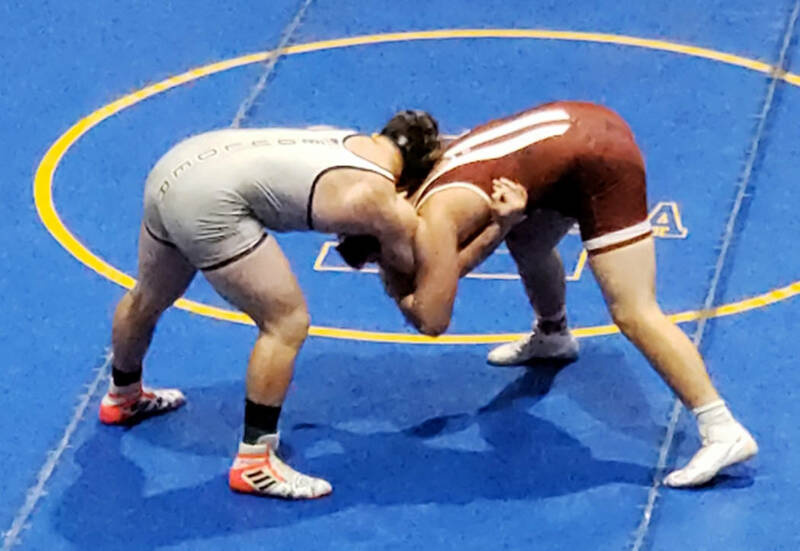 (Valerie Vanario) Boulder City High School senior Ryan Vanario defeats John Baloyot of Valley in the 220-pound weight division at the state wrestling finals in Winnemucca, Nevada, on Saturday, Feb. 9, 2019. Helping guide the Eagles to a third-place finish at the 3A state meet in Winnemucca on Saturday, Feb. 9, with an overall team score of 77, Dunagan placed first in the 195-pound division and Vanario won the 220-pound class. Northern Nevada challenger Spring Creek cruised to the state title with 236 points, while Boulder City rival Virgin Valley placed second with 83 points. Ending their prep careers on a high note, Dunagan defeated last year’s state champion Jeff Guthrie from Spring Creek in a grueling 3-2 decision, while Vanario dominated Northern Nevada challenger Setriano Pirrodi from Fernley in a 5-1 decision. Junior Ladd Cox (152 pounds) placed second, falling to Churchill County’s Tommy McCormick 17-4 in the final. Senior Mike Kaposta (285 pounds) ended his high school career with a fourth-place finish, falling to Mojave’s Ivan Parra 5-4. Losing three of their top-four finishers will certainly be a blow to the Eagles’ state title hopes next season, but juniors Curtis Brown (126), Danny Pate (138), Ayden Fradella (145) and Cade Cowley (170), who all competed at the state meet, return for one last run.